Track Record Holder in Two States . WON 29 RACES plus 11 placings in 51 starts. HIS SIRE:WORLD TITLE (Star Title x Youngarra) Acclaimed sprinter of great natural early pace, sire of numerous quality performers. Pali Gap (Grove Whisper x Cinnamon Girl) Pali Gap dam also of Saintly Gold – dam of Hint Of Shiraz, winner of 16 races incl 3 starts at The Meadows for 2 wins & a 3rd.Granddam Cinnamon Girl , dam of Incline, whose progeny have had 52 wins – from 15 indivdual winners, Treasury Fair – leading dam at Traralgon & Warragul 1999, Typhoon Tanya – dam of one litter to race for 6 individual winners.Creole Flyer – dam of Demon Daniel – a winner of 6 racesincluding Wentworth Park. Indeed a prepotent line. 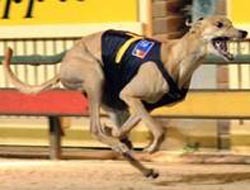 One of the most interesting features of BOOMEROO’S Pedigree is the extremely close up proximity of Grove Whisper(Ire) whose influence at this stage of a pedigree allows for a breeders to enhance any previous outcrosses and take advantage of any closely bred Australian lines that may be previously proven to the famous Irish line. Attendances leapt and betting turnover increased when he was scheduled to race. Truly a crowd pleasing favourite.